If your air conditioner is low on refrigerant, this could be a sign that your AC has a leak. When it comes to the environment, a refrigerant leak can be quite harmful – if your air conditioner has a leak, it’s best to get it repaired as soon as possible. When you call in a professional technician, they will diagnose the problem, fix the leak, and then test their repair to ensure there is no longer a leak. They will also charge your AC system with more refrigerant. For your air conditioner to perform to its full potential, the refrigerant charge should perfectly match the specifications of the manufacturer. Some air conditioners have a thermostat sensor built into them. If the sensor is no longer in the right position, it won’t be able to measure the air that comes into the evaporator coils temperature. If the sensor is not correctly placed, it could cause the air conditioner to cycle continuously. The sensor needs to be next to the coil, but it should not be touching it – a professional technician can easily adjust the position of it for you. Over time, the components of your AC system will suffer from some wear and tear so air conditioners need an annual maintenance check. If your air conditioner has not been properly looked after, the components inside of your AC could need some repairs. If one component isn’t working properly, it affects the rest of the components and there’s the possibility of a complete system failure. If your air conditioner has been installed by someone who is not a professional and they haven’t done the wiring very well, you will want to call out a professional technician. 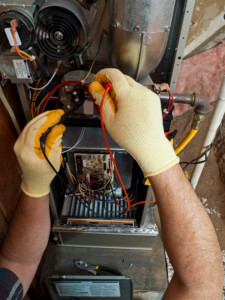 They will be able to reinstall your air conditioner, so it’s safe and hazard free. Bad wiring could potentially cause a fire and it also stops your air conditioner from being able to get the power that it needs. The outdoor fan of your AC plays a significant role in sending heat from inside your home to the outside. If your air conditioner’s outdoor fan is not working correctly or not working at all, it’s preventing the appropriate heat transfer. If the heat cannot transfer, your air conditioner runs the risk of overheating. There are a few different problems that can cause your air conditioner to freeze up. One of the reasons is frozen coils – if your air conditioner has frozen coils, you may be low on refrigerant. It’s also a sign that there could be something wrong with your AC’s airflow. Dirty filters can affect your air conditioners airflow so you should clean or replace these. Another problem that can cause your air conditioner to freeze is if the blower fan is not working correctly – the cold air will remain inside of the AC unit and freeze components such as the coil.